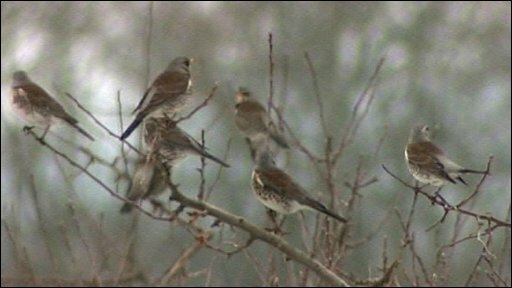 The arrival of thousands of fieldfares feeding at a Suffolk orchard has been described as "astonishing". RSPB spokesman Mark Nowers, who estimated there were more than 5,000 birds at the orchard near Sudbury, said it was a record for Suffolk and the sight had left him speechless. The birds have flown in from Scandinavia, driven by the cold weather.